Lori and Rebecca got back this afternoon from a long weekend trip up North to visit Lori's Boston-area friends. Unfortunately her friend Kristin had to leave the country on business unexpectedly but Lori was able to visit with Kristin's husband Aaron, their two cute kids and her friend Jaime and Jaime's daughters. Apparently Rebecca was adored by all (as she should be). Their absence set into motion another whirlwind Guys Weekend. Saturday. The kids woke me up early as usual and we had some quick breakfast and headed out to Josh's final soccer game of the season. Alex enjoyed himself as usual and we watched Josh run the pitch to a tune of 4 goals and 1 nice assist. He was on the far side of the field and I screamed "pass it to Ryan!" He did and kicked a long laser pass right to the front of the goal which Ryan "drilled" home. We had a team bagel/donut party afterwards and Josh got a participatory trophy for his first season. Stay tuned for Spring 2010 when Josh Rose joins WSLL (West Springfield Little League) in the teeball division. I'm hoping they put him on the Nationals (the teams are named after real MLB teams). 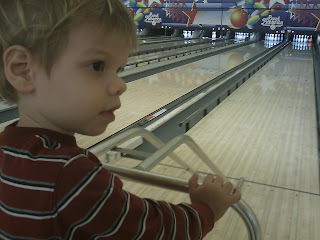 After soccer we went home for lunch and following the kids' naps the three of us went out to the local Bowl America to get our strike on. This was Josh's third time bowling (he had gone a few years ago with me and went with his class on a field trip once) and Alex's first effort. I failed to anticipate the fact that Alex would protest putting on bowling shoes. I should have known as he resists pretty much any new article of clothing. After only a few minutes of whining, I managed to get him to keep them on. They were small velcro shoes and the velcro kept flying off but overall it worked and he didn't have a major issue with them. We bowled two games and Alex actually had a better score than Josh (93 to 85). He did have an advantage though as I decided to use the handicapped ramp for his bowls after seeing that his velocity didn't get the ball all the way to the pins on its own. I think two year olds get a pass when it comes to the bowling ramp. 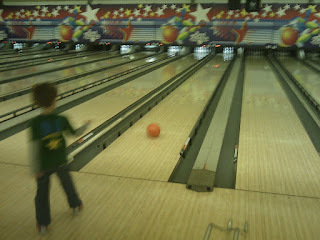 Josh put his fingers in the holes and used the bumpers well. Both kids had a great time and I can see a return to the lanes in the future for sure. I bowled a 189 and am hoping to get back into league bowling again one of these years (if my deadbeat friends ever have interest). Sunday. Earlier in the week I had decided to make Muenster Cheese Bread over the weekend and bought ingredients on Saturday. I was going to make it in the morning but the weather was so nice outside I took the kids out to Gravely Point Park for another repeat Guys Weekend activity of watching planes take off from National Airport. Perfect weather for plane watching but Alex was even more "afraid" of the planes. He kept his hands over his ears practically the entire time we were there. He wanted to leave the "AirplanePort" as soon as possible. After kicking around the soccer ball a bit in the field at the park we got in the car and headed back home. 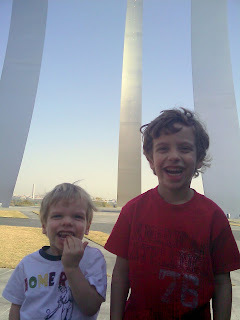 On the way back we made a pit stop at the Air Force Memorial near the Pentagon. This is a relatively new memorial in the DC area and I've driven by it numerous times. It's a unique metal sculpture of three curved spires all reaching upwards at different heights. 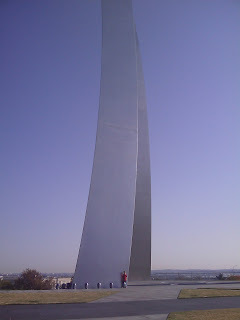 It really is a cool looking memorial and the kids enjoyed walking up close to it. They also enjoyed running and chasing each other across the memorial grounds. After the morning activities and naps we spent the afternoon watching football (AKA witnessing another lifeless performance from the Washington Redskins) and cooking. I completed my cheese bread effort just in time for dinner. Josh "helped" by throwing some stuff away for me during the preparation process. The bread turned out good and is almost gone as I write this (we all had some for dinner tonight). Alex and Josh still call it "Monster" Cheese Bread. Perhaps I should put green food coloring in the cheese mixture next time. Another session of bath and stories put an end to Guys Weekend 2009. We all missed Lori and Rebecca during their trip but it was enjoyable to have a few days to hang with just the boys. As Josh and Alex get older these types of weekends will become more adventurous as we'll be able to go out and do more. As I continue to chug along with this blog (less frequently lately I know due to a phenomenon I have dubbed "The Rebecca Factor"), I feel it is starting to serve as a virtual scrapbook that the kids can look back on when they get older making Blog! There it is... into a multi-faceted medium of communication. Ah... the Internet... is there anything it can't do? What a wonderful weekend with da boys! I am impressed with your ability to get out of the house with two little ones. I find it hard enough to do with just one! Hey Stacey, it actually gets easier as they get older because you don't need to worry about diapers, etc... Josh becomes more of a help than a hindrance at age 5.